Do you want to have better eye contact while speaking? 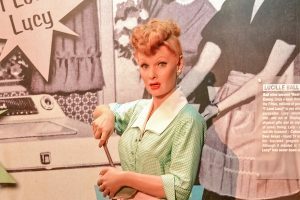 “Hey look me over… lend me an ear” is the first line of a Broadway musical song sung by Lucille Ball. How could this line relate to better eye contact when speaking? When I think of this line, I don’t imagine Lucille in one of her whacky performances. I think of you standing in front of an audience ready to speak. How does it feel when all eyes of an audience look you over? Are your knees quivering? Is your face turning red? You might even suffer some anxiety just at the thought of being in the center of the hot spotlight. If being looked at while you speak makes you nervous, I have an exercise for you. This exercise will change the way you feel when you are in front of a group. I call it the “Hey Look Me Over” Exercise. It will help you feel at ease when all eyes stare at you from every corner of the room. I’ve created a short video guiding you through the “Hey Look Me Over” Exercise. I’d love to share this video with you. Click here to view. If you would like to learn how to be comfortable standing in front of a group, let me know. You can be yourself and speak without the physical nerves that rattle your body and make you self-conscious. Click here to contact me.